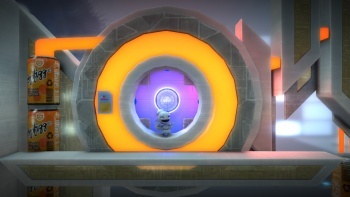 LittleBigPlanet wasn't always a side-scroller, but the third dimension proved to be too much possibility for the game's designers. Media Molecule has revealed that LittleBigPlanet was at one time planned as a 3D platformer. Originally, the game's levels were not designed along a 2D plane with three layers, but in full 3D, as with games like Ratchet & Clank. Media Molecule co-founder Alex Evans told Joystiq at Gamescom that an early build of LittleBigPlanet had "free depth and completely moving cameras, and the gameplay engine wasn't layered fundamentally." Levels could "travel into the screen," so Sackboys were able to move more than just left and right. Evans admitted that this level of freedom was "really hard" and "creatively unconstrained." He says: "We found our level designers wasted tons of time in 3D land, so we iteratively reduced it; first of all, we reduced the scope, then we added the layers, and with each restriction we did, it improved the quality." That doesn't mean that LittleBigPlanet will never become a 3D platformer, though. November's LittleBigPlanet 2 might still be focusing on side-scrolling gameplay, for Media Molecule's levels anyway (with untold game types user-creatable), but Evans believes the series will go 3D in the future, though it'll be a challenge to allow players to create in 3D rather than just 2D. He states: "When we go 3D, and I'm assuming at some point we will go 3D, the challenge we will have, and any other user-generated content company -- you know, I want to be one-upped, I'd love to see a fully-3D creation game. I'm not saying it's impossible, I'm saying we haven't cracked it yet." Just as LittleBigPlanet 2 is said to expand the series' creation tools far beyond the first game's, maybe LittleBigPlanet 3 will move them into the third dimension.